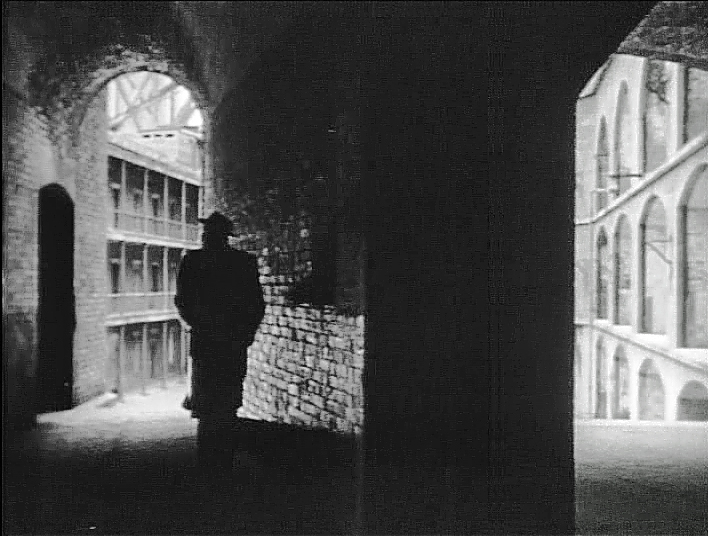 With all roads out of the city blocked off by the police Cullen decides their best option is to hide out at Fort Point until they can sneak out after dark. The sequence that follows plays out to the lonely sound of the moaning wind but has suspense aplenty. Even better for location buffs it's a record of the old Fort as it was over 60 years ago. 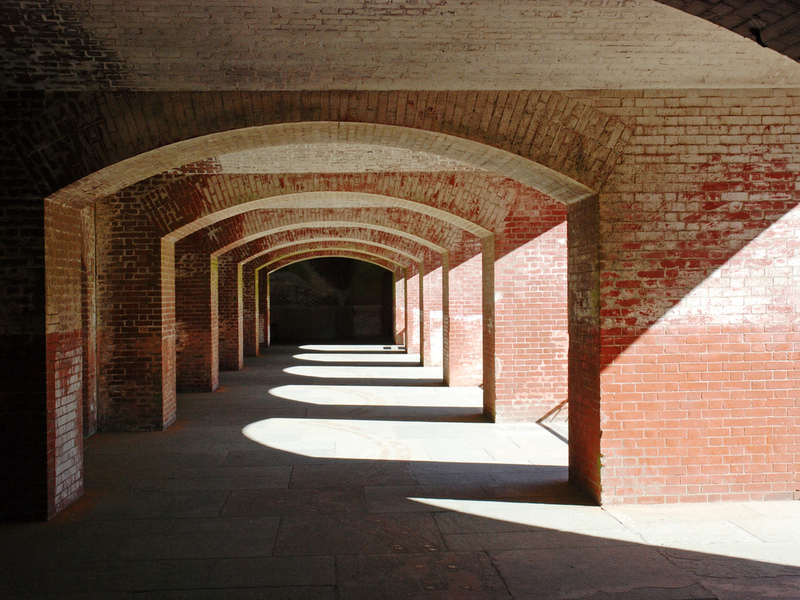 Fort Point (map) was constructed between 1853 and 1861; its armaments were initially designed to defend against possible Confederate attack during the Civil War. 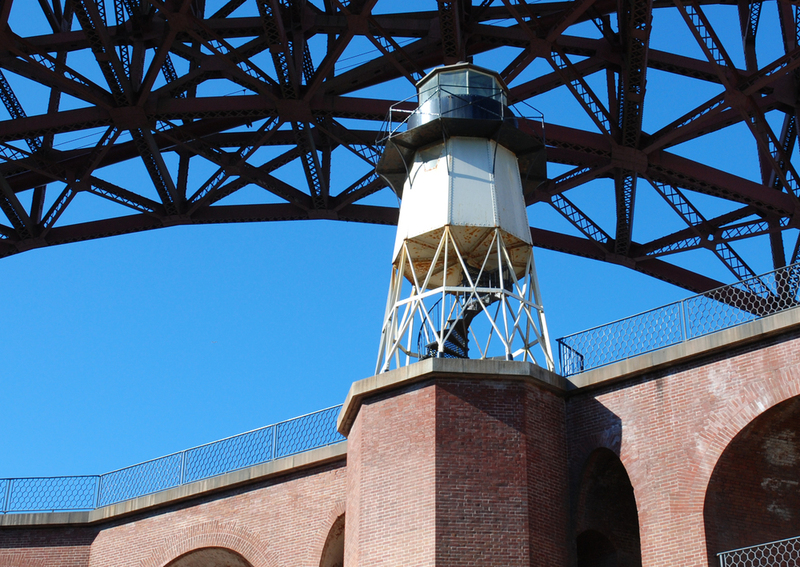 The fort never was fired upon throughout its 150 year existence but dodged a significant bullet when the original plan to demolish it in the 1930s to make way for the Golden Gate Bridge was reversed by the bridge's chief engineer Joseph Strauss. Instead, he designed a steel span to arch over the fort. Then ... Dust swirls as they approach the sallyport, the only way into and out of the fort. It's on the south side, known as the gorge, considered the front of the structure. The post and platform structure at right appears to be bringing in temporary electrical power. ... and Now, one might expect a National Historic site not to show many changes over the mere half-century of our Then and Now comparison and this indeed turns out to be the case. Those openings in the gorge wall were originally narrow rifle slits but were later widened. Then ... When Cullen's 1950 Nash Ambassador pulls up in the interior courtyard the shot of the sleek fastback with its skirted wheels could double as a car advertisement (click image to enlarge). ... and Now, the courtyard used to be the parade ground. The gorge on the left housed military quarters and magazines; it was accessed via balconies supported by fluted cast iron columns. In the corner (the west end of the fort) is the tower enclosing stairs #1, one of three circular masonry staircases connecting all levels, topped by a wooden penthouse (click image to enlarge). Then ... Cullen finds a concealed spot for his vehicle and they consider where to hide out. The sound of an approaching car sends them scurrying to the lighthouse on the roof. ... and Now, visitors are not allowed into the lighthouse for safety reasons but here, taken from the rooftop, is a recent photo of its view. Then ... It's Cullen's brother Andy in the car (a 1950 Nash Rambler convertible). 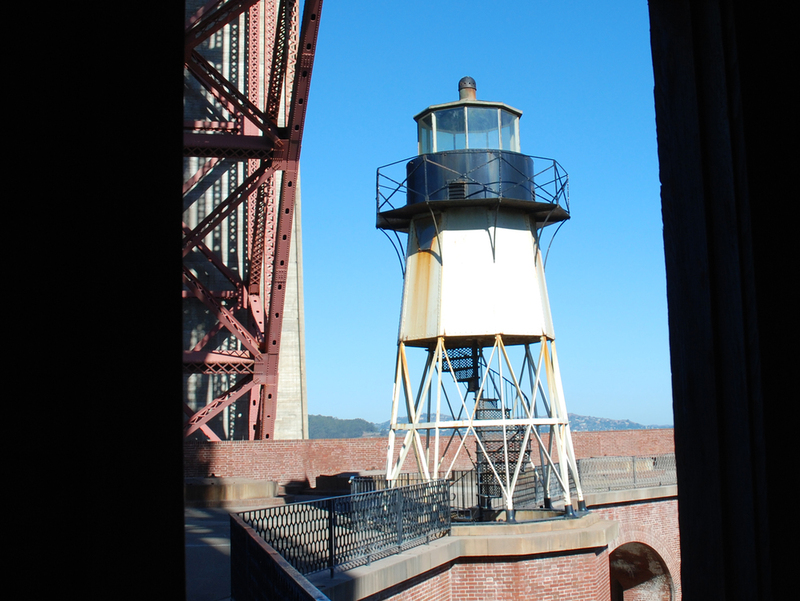 He recalls they played at Fort Point as kids and decides on a hunch that it might be their refuge. This is his first case and he is determined to see justice done. 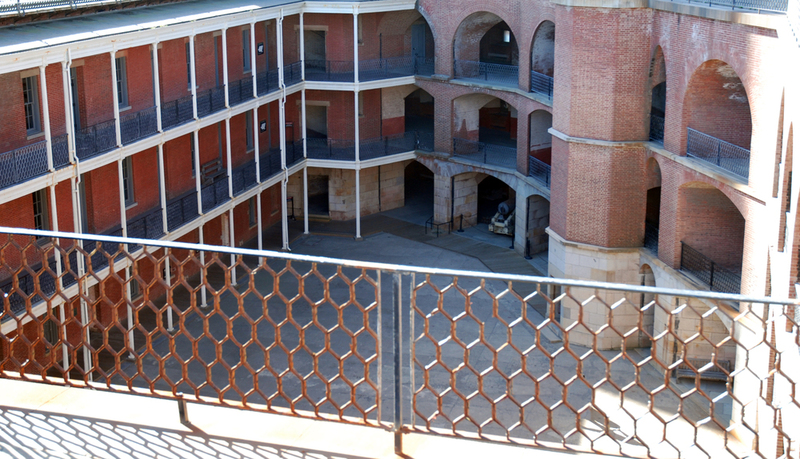 He pulls into the courtyard, also viewed from the rooftop of the fort. ... and Now, the fort is open two days a week for visitors; as a result safety railings have been added or repaired. Back then, above, it was soldier beware! Note that the arches at center rear have been un-bricked. 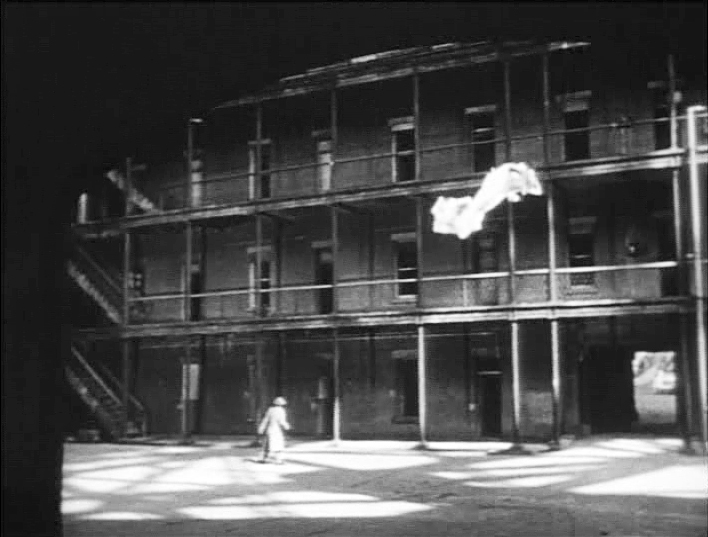 Then ... As he stands in the courtyard wondering where they could be we see the hiding place on the roof in the shadow of the Golden Gate Bridge's arched span. ... and Now, this lighthouse dates back to 1863. 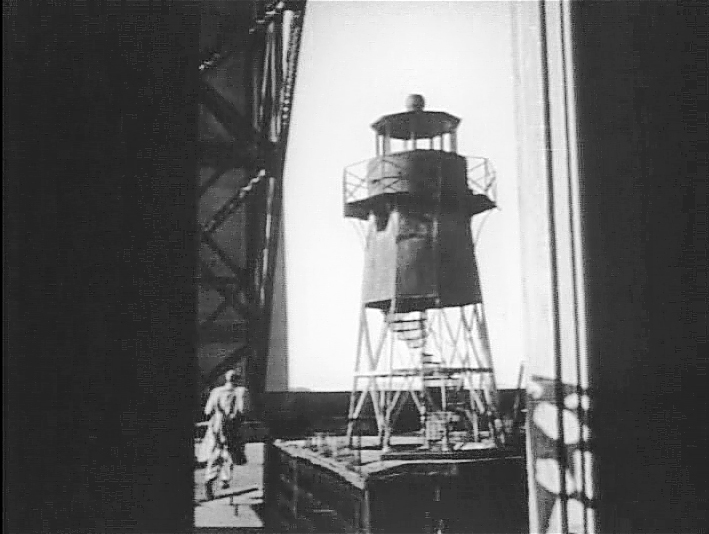 It was deactivated in 1934 when the new bridge towers, a more effective beacon for mariners, were built. But the lighthouse structure - it sits atop stairs #2 - has survived thanks to major restorations in 1973 and 1992. Andy disregards a note left by his brother implying the two miscreants had abandoned their car and fled. Instead he methodically searches the fort one tier at a time, in a way taking us on an extensive tour of the historic structure. Then ... 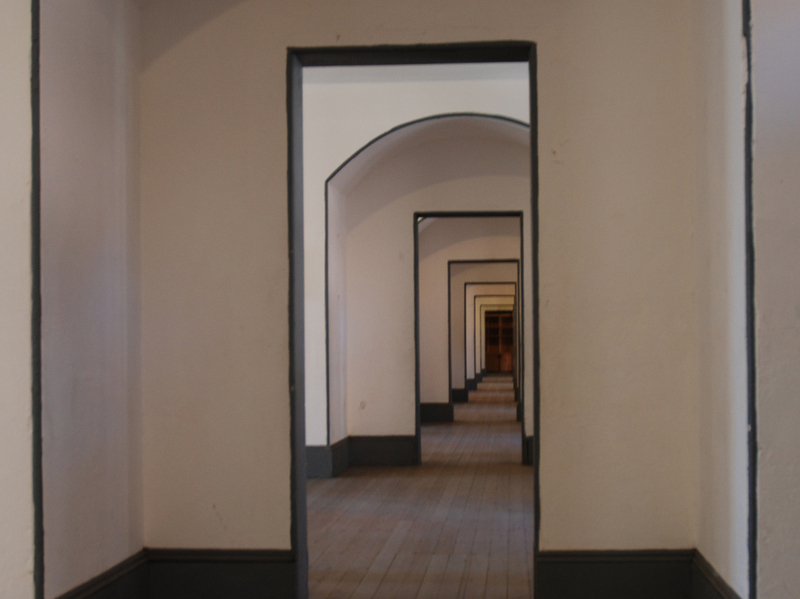 He walks the length of the officer's quarters on the 2nd tier where the corridor splits each room via central receding doorways. Not much privacy for the officers! 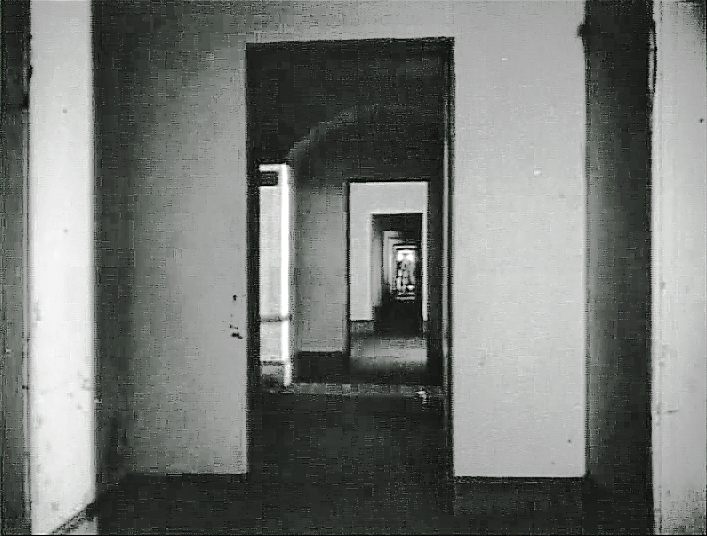 ... and Now, the shouts and footfalls of the officers have now been replaced by the sound of visitor's camera shutters. Then ... Still on the second tier he is next to the doorway leading to stairs #3. Note the absence of safety railings. ... and Now, the same spot today, with railings. Can't have today's visitors falling over the edge can we? Then ... At the other end of the second tier he walks the length of the brick casemates that originally housed a battery of cannons arrayed along the left (north) side with their muzzles facing out through reinforced embrasure openings. There are 30 casemates on each of the first three tiers. ... and Now, another photographer's opportunity. Then ... On the roof, viewed from inside the wooden penthouse that covers stairs #1, Andy runs to the lighthouse. Will he find the crouching couple? 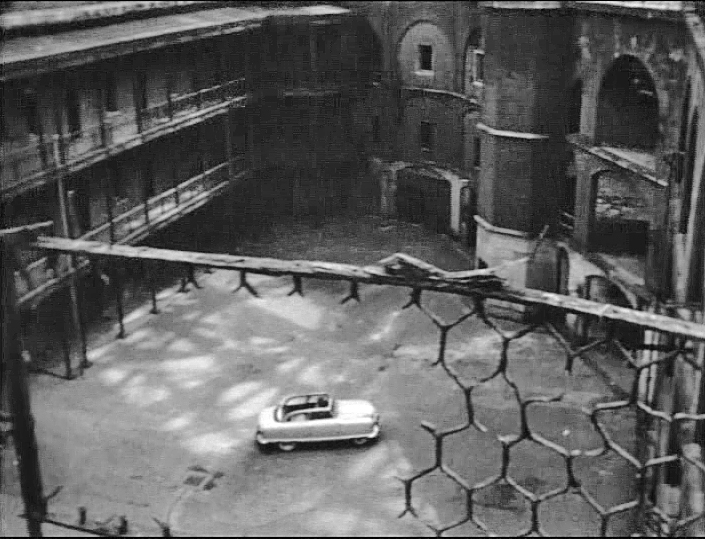 ... and Now, the roof, known as the barbette tier, wraps around the perimeter of the fort. Its deck, concrete now but grass when it was first built, was originally designed with cannons mounted on exposed pedestals to augment those in enclosed casements on the lower tiers. The lighthouse, despite periodic maintenance, is again showing signs of rust. Then ... Andy climbs the spiral staircase into the lighthouse but they are not there, having crept out ahead of him onto the balcony. 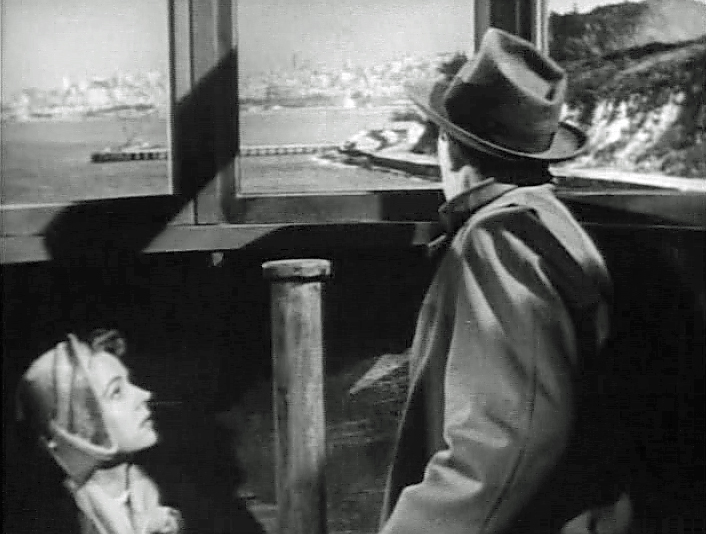 He appears to give up and returns to his car but not before a moment of suspense when Lois's scarf is whipped away by the wind and wafts slowly down tantalizingly close to him as he heads to the sallyport exit. But it goes unnoticed and he drives off. ... and Now, in this matching courtyard photo CitySleuth was fortunate to catch Civil War re-enacters performing drill. The gorge's balconied tiers behind them each have a stairway at far left, known as stairs #4. Unlike the other three they are metal and straight, not masonry and circular. When darkness falls Cullen and Lois sneak out of the fort straight into the arms and handcuffs of the waiting poiice. Andy's hunch had paid off. In a brief final scene their paths cross while they await trial and Cullen offers her a cigarette. He had tried to cheat the law but ended up cheating himself. No words are spoken as they part but their expressions say it all - she acknowledging his sacrifice and he accepting his fate but with no regrets.